Gestational diabetes mellitus (GDM), defined as diabetes diagnosed during pregnancy, affects a significant proportion of women worldwide. Pregnant women usually develop gestational diabetes between the second or third of pregnancy. According to a 2017 study, in India alone, GDM affects nearly five million women every year. The study also highlighted the fact that prediabetes and diabetes affect approximately six million births in India alone, of which 90% are due to GDM. It also contributes to about 90% of diabetes complicating pregnancy. Why Should YOU Be Concerned About GDM? GDM not only imposes immediate risks for both mother and fetus but can also affect the future health of both the mother and child throughout their life. -Oligohydramnios (deficiency of amniotic fluid). Moreover, women with GDM are at an increased risk of GDM in future pregnancies as well as at a higher risk of developing type 2 diabetes in the future. It also increases the risk of obesity and glucose intolerance (diabetes) in the offspring in the future. Due to the major repercussions in mother and baby, it is important for every pregnant woman to be aware of GDM. Reduce your diabetes care expenses by up to 50%. Sign Up for 1mg Diabetes Care Plan. 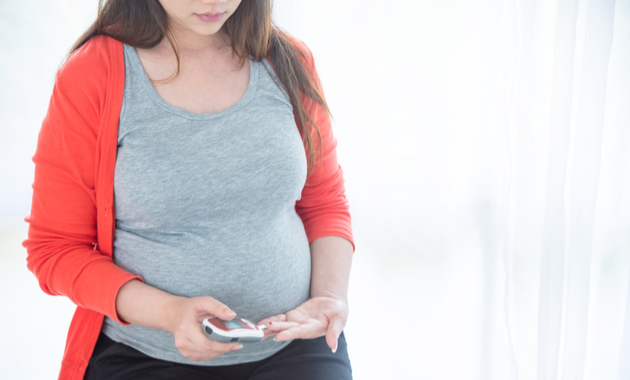 Are There Any Signs And Symptoms Of Gestational Diabetes? What Increases Your Risk Of Gestational Diabetes? Pregnant women are recommended to go for a routine health check-up, talk to your doctor and check with him/her the tests you need to take. Avoid missing the tests recommended by your doctor. During pregnancy, the glycemic targets are different. One of the reasons is that during pregnancy the HbA1C level is slightly lower because red blood cell turnover increases at this time. -A fasting blood glucose level ranging between 90-140 mg/dL (5.1 to 6.9 mmol/L). -A 2-hour blood glucose level of 200 mg/dL (11.1 mmol/L) after an oral dosage of 75 g glucose. -A random blood glucose level of 200 mg/dL (11.1 mmol/L) during the presence of diabetes symptoms. Get Tested for Diabetes at Affordable Prices @1mg labs! How To Manage Gestational Diabetes? Diabetes during pregnancy can be managed if proper care is followed during this time. The treatment varies from person to person depending upon the blood glucose level. You should get regular checkups of your blood sugar level and follow a strict diet plan. Consult a dietician for the diet plan to ensure that you are not eating anything that can worsen your condition but get the right nutrition for a healthy pregnancy. Depending on the glucose level, your doctor may suggest medication or insulin for diabetes control. Also, you must keep a glucose monitoring device handy for checking blood sugar at regular intervals. You must also ask your doctor to let you know the measures to be followed if your blood glucose level drops than the normal range. Will Gestational Diabetes Affect Your Baby? If proper medications or care is not followed during pregnancy to control gestational diabetes, there might be risks during and after the pregnancy. In the majority of cases, gestational diabetes is spotted at the right time, and proper measures are taken to avoid the complications. If your blood sugar level is extremely high, it may reach your baby via the placenta. It will result in an abnormal increase in the baby’s body weight complicating the delivery procedure. In the rarest cases, chances will be that your baby will be stillborn. Uncontrolled blood glucose level can also lead to an increase in the amniotic fluid content around the baby known as polyhydramnios. It can cause severe impacts on the baby such as premature delivery, low blood sugar levels, overweight baby, and temporary issues related to breathing. On the other hand, there is a high chance that you can have type 2 diabetes later in life, and develop preeclampsia during pregnancy. A balanced healthy diet is a key to keep gestational diabetes in check. A right balance of carbohydrates, protein, and fat intake will significantly help in keeping the sugar level of the blood. It is recommended to eat nutritious food every two hours. If you are overweight, your doctor would ask you to cut down on weight so as to improve your diabetes control. Healthy Diet: For pregnant women, it is recommended to include foods rich in carbohydrates that release sugar content slowly. Such carbohydrates rich foods include whole and non-refined grains. You would need to avoid fatty foods and replace them with protein-rich foods. Physical Activity: Earlier, women used to do the household chores even when pregnant which provided a healthy physical movement to the body. However, in recent times, the lack of body movement during pregnancy has complicated the situation. Along with a healthy diet, it is essential to be physically active during this time. Maintaining a healthy body weight will help you prevent any complications during or after your pregnancy. Healthy exercise will help in maintaining your blood sugar level and the blood pressure of your body. Always remember to consult your doctor to know what type of exercises will be perfect for you at the time. Monitors, Lancets And Test Strips. One Stop Solution For Diabetic Patients…!! If you are pregnant and haven’t checked your blood sugar level, consult your doctor immediately. You also need to carefully plan all future pregnancies. Gestational diabetes is manageable with proper care and planning. So, do not worry, stay calm and follow the advice of your doctor to stay healthy. 1.Morampudi S, Balasubramanian G, Gowda A, Zomorodi B, Patil AS. The Challenges and Recommendations for Gestational Diabetes Mellitus Care in India: A Review. Front Endocrinol (Lausanne). 2017 Mar 24;8:56. 2. Rajput R, Yadav Y, Nanda S, Rajput M. Prevalence of gestational diabetes mellitus & associated risk factors at a tertiary care hospital in Haryana. Indian J Med Res. 2013 Apr;137(4):728-33. 3. American Diabetes Association. 13. Management of Diabetes in Pregnancy:Standards of Medical Care in Diabetes—2018. Diabetes Care. 2017;41(Supplement 1):S137-S143. [cited 27 September 2018]. 4. WHO recommendation on the diagnosis of gestational diabetes in pregnancy | RHL [Internet]. Extranet.who.int. 2018 [cited 21 September 2018]. 5. American Diabetes Association. 13. Management of Diabetes in Pregnancy:Standards of Medical Care in Diabetes—2018. Diabetes Care. 2017;41(Supplement 1):S137-S143. 6. CDC. CDC – Gestational Diabetes and Pregnancy [Internet]. Centers for Disease Control and Prevention. 2018 [cited 10 September 2018]. 7. Women’s & Children’s Hospital. Healthy Eating for Gestational Diabetes [Internet]. wch.sa.gov.au. 2014 [cited 27 September 2018]. 8. CDC. Gestational Diabetes | Basics | Diabetes | CDC [Internet]. cdc.gov. 2018 [cited 10 September 2018]. ← World Health Day: Top 5 Unhealthy Habits YOU Must Quit!